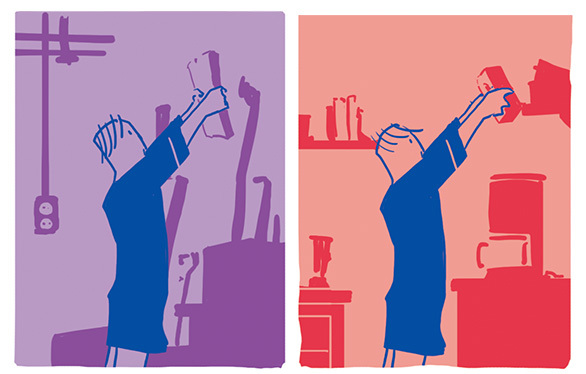 If you haven’t read the For No One comic yet, you can do it right here. This article is also summarized in a little video I made, which you can check out here. If you want to listen to my own version of the song, you can watch me and Marcel play For No One, right here. Since this comic is based on For No One by The Beatles. 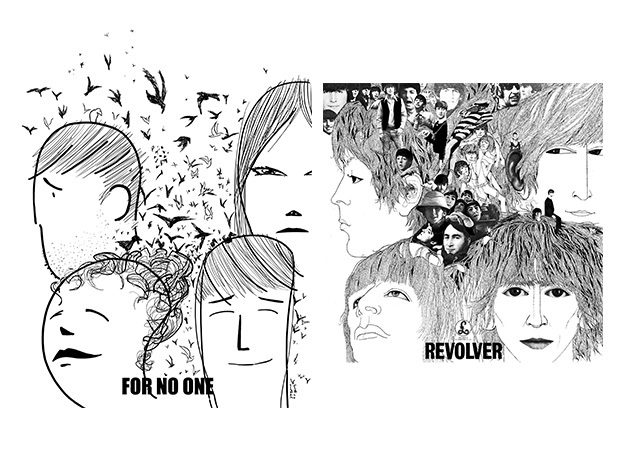 And that song is on their Revolver album, I thought it woul be nice to create a cover based on the iconic album cover. Created by Klaus Voorman, the image holds portraits of the four Beatles, combined with a collage of pictures and doodles. For my version I drew each of the two main characters of the comic twice. Once in a happy state, once in a sad state. Instead of a collage (not really what I’m into, sorry) I chose to use the two birds from the story (more on that later). If I listen to the song lyrics, I hear a relationship that’s in a rut. A man still in love with a woman. She takes him for granted. That became the starting point for my story here. We start with Paul, getting up, making breakfast for his Linda. We see him moving through the house. We see Paul working in the garage. In the captions we read a letter addressed to Linda about some high school reunion. After that we see Linda get up, walk through the house, shower. She writes Paul a note: she decided to go to the reunion. Then there’s an intermezzo. We zoom in on the picture frames we already saw hanging on the wall. The pictures tell the story of two birds meeting each other. The remaining frames are still empty. Next morning, Paul wakes without Linda. He walks through the house. Has some coffe. Showers. Does some groceries and works in the garage. We hear his phone call with Linda. Apparently she decided to stay the night at a friends place, yesterday after the reunion. Paul is to scared to ask, but between you and me, I think she hooked up with a guy over there. Then we see the house being empty. The thing Paul is working on in the garage appears to be a bird house of some sort. Intermezzo II shows the same picture frames, only now we see more of the story. After the kids left, the birds flew into town. Looking for a place to grow old together. That night, Paul is up till late. Linda still hasn’t come back. He can’t sleep and wonders through the house. When Linda finally does come home, he confronts her. She plays down his accusations. In the WhatsApp conversation leading up to this, she claims to be with her friend Eleanor. In the last scene we see Paul. While Linda still sleeps – again. Apparently Paul accepts his faith. Meanwhile the birdhouse made it into the garden. Intermezzo III shows us the birds moving into that same birdhouse. Their journey an analogy for Paul and Linda before they started living together. And still thought a happy ever after was within reach. So in what way does this comic connect to the song exactly. I actually took a song as a starting point for a comic before. For my interpretation of Salty & Sweet I made a comic about the story that’s told within the song and elaborated on that. You could argue it was an interpretation on a story-level. But for some time I’ve been wondering if you could maybe apply the musical structure of a song into a graphic medium such as comics. 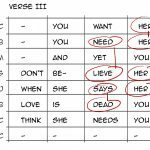 A song is, if you strip it, not much more than a diagram in a way. Just like comic book panels actually. So since I dubbed myself a comicsperimenter [LINK] I thought I might a well give it a shot. Since this is the For No One Comic Breakdown, let’s start by breaking down the music. I based this comic on the original Beatles song. One of the nice things about For No One, is that it doesn’t have in intro or outro. The thing just starts. 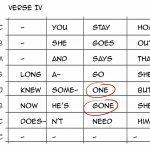 That way each verse or chorus can be thought of as a confined little block. Actually this nearly is a transcription of the song. Each bar is roughly four beats. 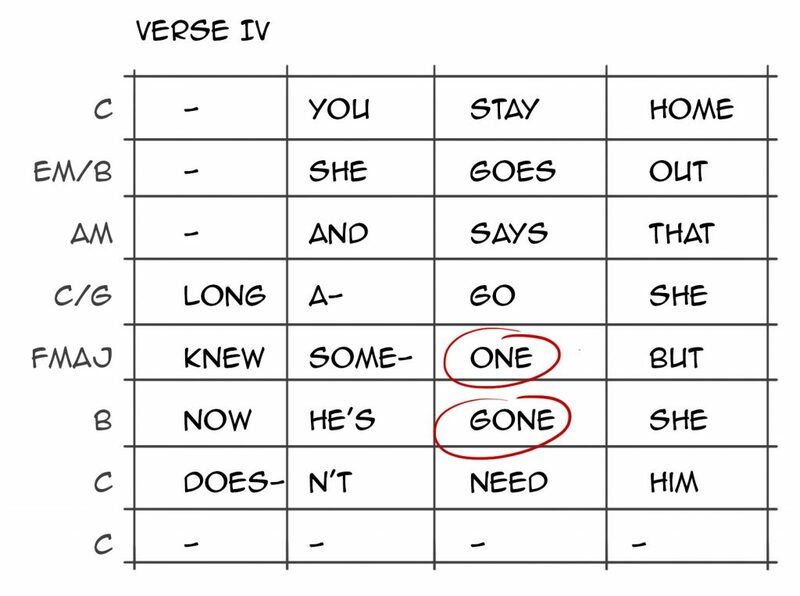 When put into a grid like this, you immediately see how little rhyme there actually is within the song. 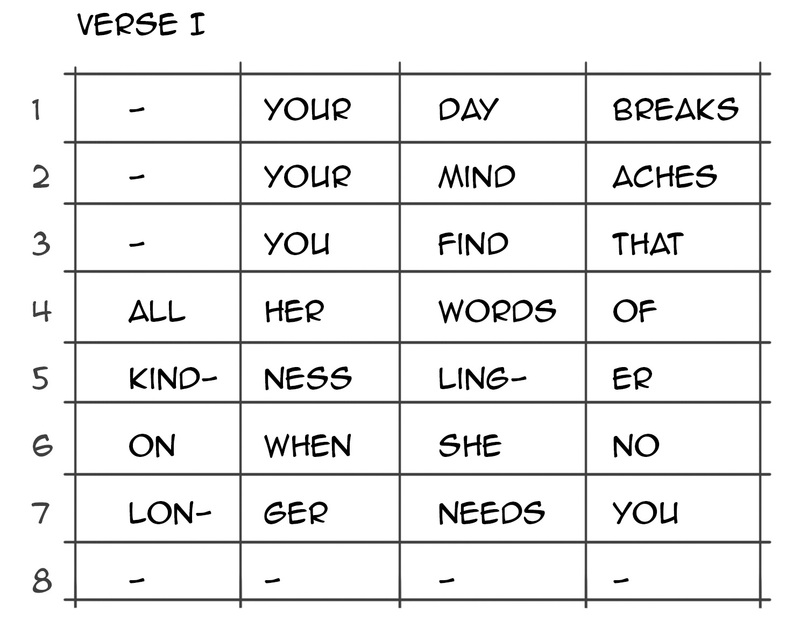 And how strangely rhyme is distributed over each chorus. 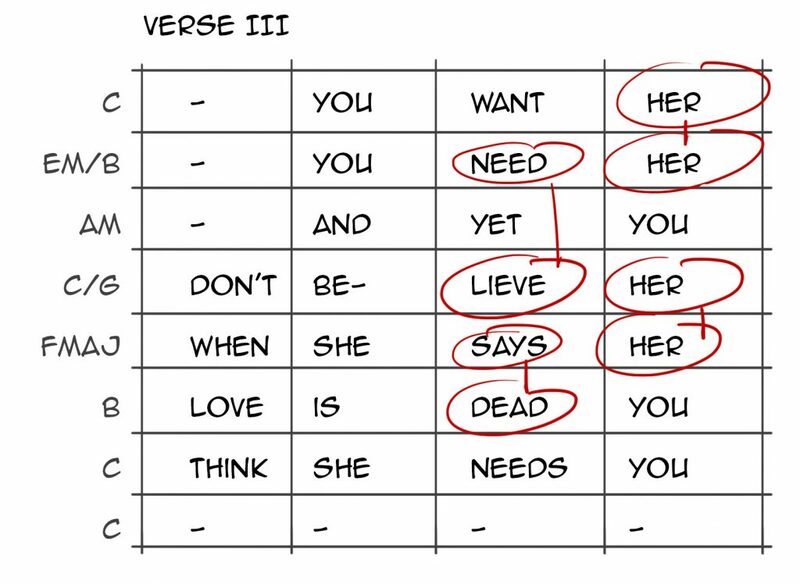 Obviously this is the same for all of the three choruses. This way we end up with a diagram of the entire song with all the chords and rhyme-couples. Now I had to a adapt these diagram into workable comic book pages. The first thing I did was split the 4×8 blocks into two 4×4 blocks for the verses. And split the 5×10 blocks into two 5×5 blocks for the choruses. Ah, a comic book pattern is emerging. When looking for a way to visualize the chords I decided it would be great to give each chord its own color. I dove deep into the world of chord-color-theory (yes, there is such a thing). I was caught a bit off guard and before I knew it, I was drowning in theories about the overlap between ultraviolet waves and sound waves. 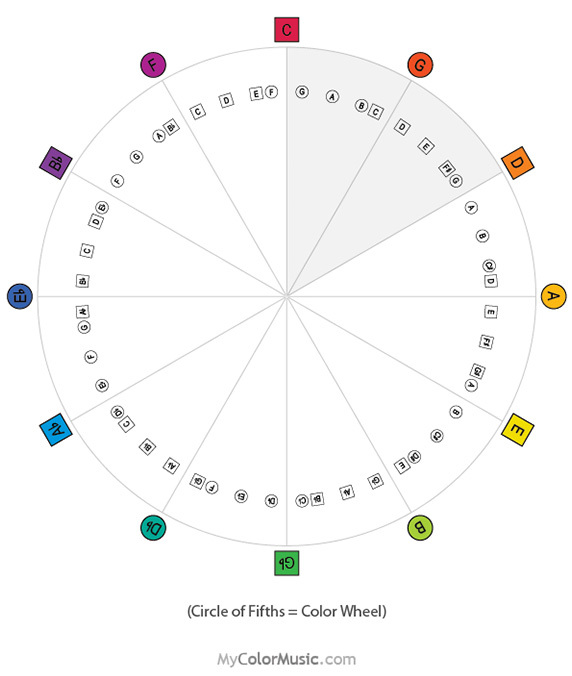 A little more useful I thought was the connection between the circle of fifths and the color wheel. As soon as I saw this over at mycolormusic.com my mind was blown. They connect primary, secondary and tertiary colors to the circle of fiths. PS – The circle of fifths ‘a geometrical representation of relationships among the 12 pitch classes of the chromatic scale’ and very useful for understanding music theory. Read more about it here, though it is in no way necessary to understand any of it for my argument. 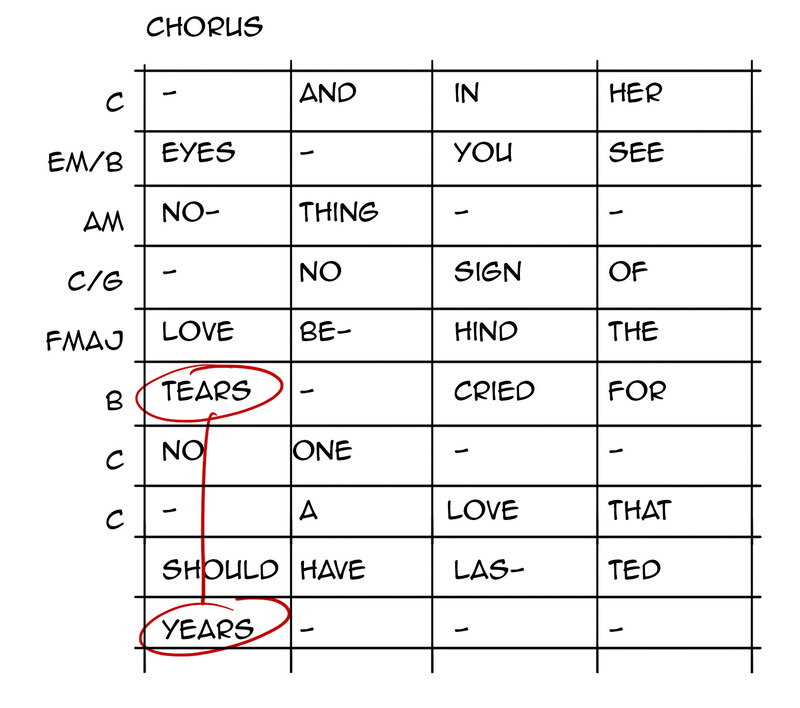 NB – to add to the confusion I’ve done this analysis in C, which is basically the easiest key to understand music in. The original version of the song is in Bmajor though. Ooohhhkay, is this turning into a comic already? Patience my dear, there is still the rhyme aspect to tackle! 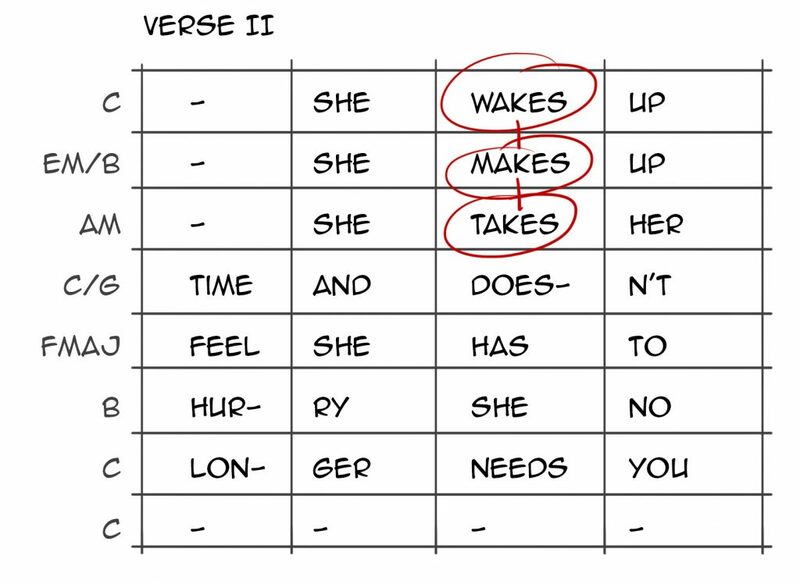 Rhyme, obviously is one of most commonly used devices for writing a song. By the repetition of similar sounds within two words, these words suddenly become a related pair. 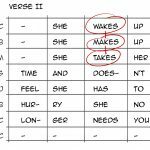 ‘Tears’ and ‘years’ are two different words with different meanings, but because of the way they rhyme (and there place within a sentence) the suddenly are linked to each other. 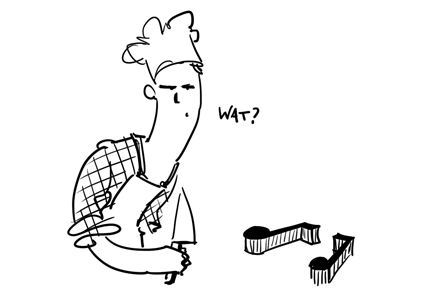 I figured the visual equivalent of that might be something like a ‘visual replication’. Two drawings that are nearly similar in composition. I applied this to the character poses. The pose isn’t exactly the same, just like two words that rhyme aren’t. But it is the same pose within a different context. 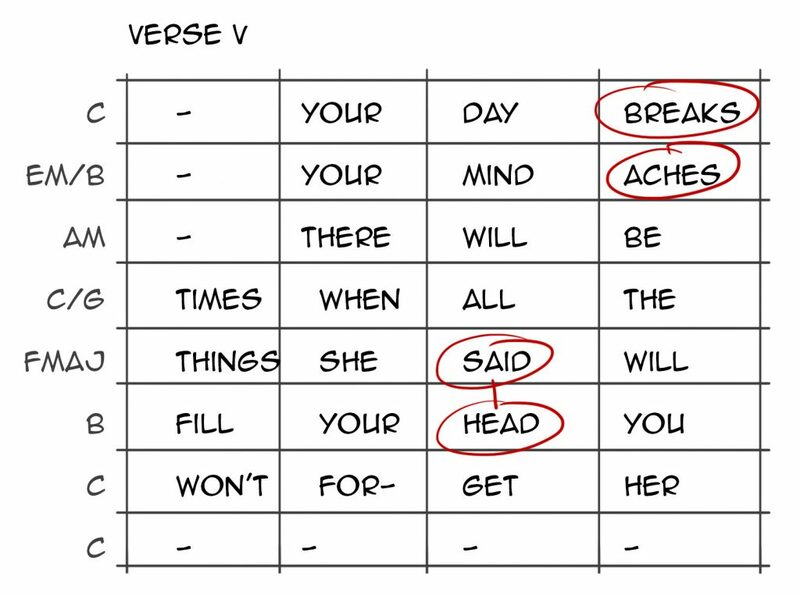 This way I could fill in the ‘rhyme-parts’ for each verse. To give the story some consistency I let it take place within a house. The repeating backgrounds – hopefully – evoke the feeling of a pattern, just like you would experience when listening to music. The For No One horn solo was quite something back in the day. Apparently McCartney asked horn player Alan Civil to play a high F – which is actually out of range of the instrument. I think it’s one of the most amazing pieces of music I ever heard. 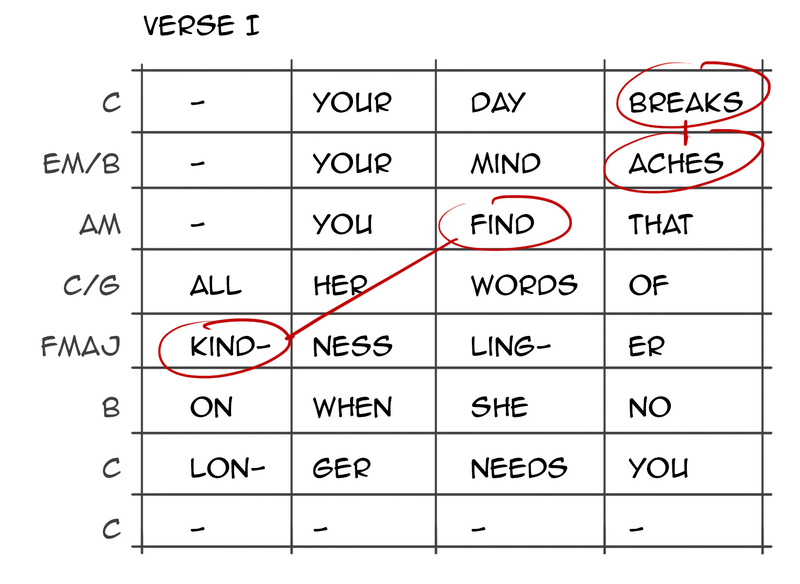 Because it’s played over the chords of the verse, we only see the backgrounds in this sequence. 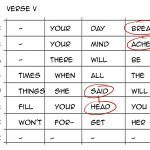 I wanted to make a clear distinction between the verses and the choruses within the comic. So I started thinking about what a chorus actually is. One of the problems obviously is that it’s the exact same thing each and every time. Mostly making the same point with slightly different words. It works in spoken (or sung) language, but visually it would not really be appealing at all. Then I realized that the words might be the same, but actually they gain meaning as the song progresses. The first time McCartney sings ‘a love that should’ve lasted years’ all we know is that it’s about two people, well, waking up basically. By the time we get to the end of the song, we know a lot more about the main characters, their suffering and why all of this is so heartbreaking. Only then we can fully understand the significance of the chorus. This led me to let the chorus-sequence unfold a little more each time. To further set it apart I chose to show the sequence within the picture frames we see in the main story. It can be seen as the way Paul and Linda maybe filled the picture frames before the events on page one. For the chorus I also used the color wheel/circle of fifths colors and applied them to the 5×5 blocks. One of the most interesting things in comics – I think – is the so called ‘verbal visual blend’. The way words and imagery work together to propel the story forward. I decided to have some fun with different forms of narrative and use a different type of text in each scene. • A how-to-webpage about birdhouses. I tried to link each text to the images we see in the art. For instance Linda’s remark about the garage. Or the mention of taking a partner, in the invite. That way a second layer is added to the narrative leading to a sum greater than its individual parts. The recording of For No One. For No One song structure and analyses. Color wheel and cirkle of fifths. My acoustic cover of the song! It’s always dangerous to put form first in any creative endeavor. Especially with stories, one of the main drivers should always be engaging the reader, not necessarily presenting a grid of information. Then again, when you deconstruct story (or music for that matter) a lot comes down to structure. So I really wanted to see if I could apply that to a comic book story. I hope this For No One Comic Breakdown gave some insight into that. Needless to say I’m very curious to hear your thoughts. And would it be worth trying this approach with other songs?